Great news for travellers looking for luxury is that more and more high-end hotels are available yet not many offer inexpensive comfort, lavishness and a great selection of amenities like the Crystal Park Casino Hotel in Compton. Offering locals and international travellers the perfect hotel accommodation near exciting cities including Rancho Dominquez Hills, Redondo Beach and Long Beach, the LA Crystal Hotel offers guests comfort, relaxation, and convenience. LA Crystal Hotel Guests can enjoy a comfortable stay, relax and enjoy a complimentary breakfast, meet friends in the lounge or unwind after a day of shopping at the on-site bar and lounge. The hotel is perfectly situated for guests enjoying great entertainment options, shopping, and plenty of great dining possibilities. Close to all amenities, great cities and offering all international and local tourist a great experience the LA Crystal Hotel offers accommodation in eight different room types perfect for business travellers, tourists, families and couples looking for a romantic getaway. What truly impresses is the superior hospitality of LA Crystal Hotel while specials are regularly available for bed & breakfast as well as family fun packages. The Crystal Park Casino Hotel, Crompton, built in 1989, offers room multiple comfortable amenities perfect for the modern guest who enjoys being close to the city. It had a major revamp in 2005 and added additional new rooms and now offered 193 rooms. They further added additional floors to accommodate guests and now boasts 9 floors. The added amenities have all been designed to provide an improved guest experience and to ensure the time spent is as wonderful as expected. The LA Crystal Hotel has many exciting promotions ready to keep its guest entertained. This gets underway with cash giveaways every hour on Friday and Saturdays. In addition to that, guests of the Crystal Park Casino Hotel can look forward to a daily freeroll as well as special cash bonuses when playing Pai Gow poker or Blackjack. To top it all off, an active loyalty points system will reward you when you play and provide you with additional incentives and special promotions. What makes all the difference is the variety of luxurious services and other amenities available in each room such as free newspapers, Satellite/Cable Television, Internet access, Safe, refrigerator, telephone, voicemail, ironing board, fitness equipment, coffeemaker, air conditioning and daily maid services. Guest Services ensure an even pleasanter stay with onsite ATM, car rental, concierge/club floor, concierge services, gift shop, wheelchair access and assistance from multilingual staff. Guest can truly relax knowing that the place offers high-security services, which includes electronic keys, sprinkler systems & smoke alarms in rooms, uniformed security officers, well-lit parking areas, and valet parking services. Guests have a fabulous variety of options when it comes to activities, which include a beautiful outdoor pool, hot tub, slackening in two Jacuzzis health spa offering relaxing massages, health club, games room and you are sure to have a great time in the casino & bingo hall. Nearby activities include water skiing, outdoor/indoor tennis, snow skiing, scuba diving, jogging trails, horseback riding, fishing, sailing/boating, bicycling, beach and a shopping mall. 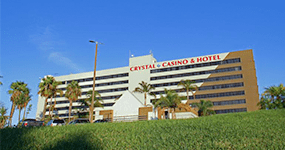 Crystal Park Casino Hotel offers a luxuriously comfortable stay in the most prime location where guests are surrounded by the beauty of Southern California beaches less than 20 miles away. A range of exceptional restaurants is within walking distance, and they present visitors with numerous shopping centres featuring different outlets including high-end fashion stores to laid back popular shops. Once you have had a few hours of relaxation, several attractions and landmarks are nearby and include the Watts Towers, Tomorrow's Aeronautical Museum, Aquarium of the Pacific, The Queens Mary and the Dominiquez Rancho Adobe Museum. Entertainment wise there is plenty to enjoy in Compton, guests can start off by enjoying the place where a variety of slots offer spinning action, and classic games include poker, blackjack and bingo offers fun play. The StubHub Centre offers great games for sports fanatics, and the Laugh Factory offers the best comedy legends. Compton Nightlife includes several places where the fun continues even after the sun goes down and include great local bars, lounges and saloons such as the Observation Bar, Sevilla Nightclub, Harvelle's Long Beach, Alex's Bar and Gallagher's.